Keith Vaz MP has recommended that the British government use state funds to treat people addicted to gaming. 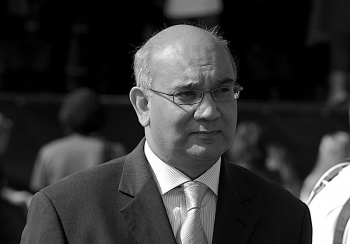 Keith Vaz, British Member of Parliament for Leicester East and chairman of the very busy Commons Home Affairs Select Committee, has long been concerned about the potential he sees for societal harm in the consumption (and over-consumption) of videogames, especially in the world's youth. Now, in response to a study that found vague similarities between the brains of internet addicts to those of people addicted to narcotics, Vaz has called for people who spend unhealthy amounts of time gaming to be treated for their addiction on the UK's state-funded National Health Service (NHS). Describing his position on the issue, Vaz said that he is "concerned" about the above-mentioned "your brain on the internet looks kinda like your brain on coke" research. "Much more research needs to be done on the potentially harmful effects of overexposure to the internet and video games," he continued. "In the most extreme cases, people have neglected to feed their children and suffered fatal deep vein thrombosis as a result of the extended time spent at their computer or games console," added Vaz. "This needs to be recognized as a serious problem by the Government. Such behavior can destroy lives and treatment and support should be available as it is for any other lifestyle problem which impacts upon mental or physical health." For gamers who are familiar with Vaz's past record (which includes a call for Parliament to assist parents in "protecting" children from games over Christmas and a slew of protests against Call of Duty: Modern Warfare 3) it's hard not to approach his announcement with skepticism. Could his call hold any water, though? Like the United States, Britain already has at least one private rehab clinic which deals with cases of gaming addiction, a "lifestyle issue" which remains the subject of much controversy. Gaming addiction is not currently included on the standard diagnostic lists for psychological disorders, though some mental health specialists have called for "pathological internet misuse" (which refers to MMOs rather than things like 4chan, despite what the name suggests) to be added to those lists. The American Psychiatric Association has also considered adding "video game addiction" to its list of disorders. Asking that the already-stretched NHS foot the bill for treatment of a disorder that is yet to be clinically acknowledged in the fullest sense seems a bit of a stretch. Given the current climate of fiscal austerity in the UK, there's virtually no chance of Vaz's request being carried out in the near future. But does that mean it couldn't or even shouldn't happen in the distant future? Does someone who spends inordinate amounts of their time gaming constitute enough of a threat to his- or herself to warrant psychiatric care? It's interesting to think about; do let us know what you think.